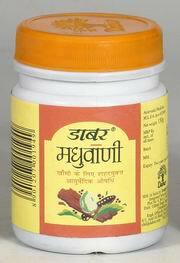 Madhuvani, is the natural reply to irritating coughs, cold and sore throats. Sitopiladi Churna, Madhu, Sharkara, Banslochan, Elaichi, Dalchini. Adult : 1-2 Tea spoon three times a day. Children : ¼-½ Tea spoon three times a day.